I was Missile Officer onboard USS Sterett (CG-31) in September 1983 when one evening the military television channel reported that a Korean airliner was overdue on its trip from New York to Seoul, Korea. There was speculation that the plane had inadvertently entered Soviet airspace and had been forced to land at a Soviet military airfield. The next day we learned that the plane had actually been shot down by the Soviets. The day after that we were told by the Captain to go home and pack our bags as we were leaving that evening to go up to the crash site, and with the admiral embarked to serve as the flagship for the search and recovery operation. 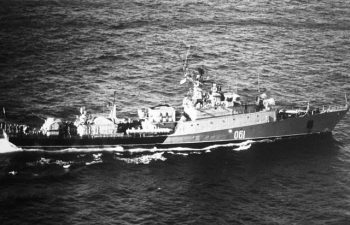 A starboard bow view of a Soviet Kara class guided missile cruiser PETROPAVLOVSK (565) shadowing salvage operations for downed Korean Air Lines Flight 007 (KAL 007). The Grisha II class were built for the KGB border guard. 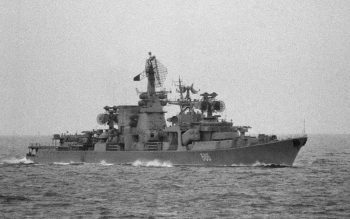 These ships had a second 57mm gun mounting replacing the SA-N-4 missile system forward.